Meteorites are particularly valuable geologic specimens because they represent samples of planetary bodies (mostly asteroids) which we have not yet obtained through either manned or unmanned space missions. Neither is it likely that samples of these bodies will be available by any other means than fortuitous falls for at least a generation. Thus, as a scientific resource, meteorites provide us with some of our first glimpses of the diverse array of planetary material scattered throughout the inner solar system. The oldest meteorite specimens are remnants of the very first geologic processes to occur in our solar system 4.6 billion years ago. (The origin of the solar system should not be confused with the origin of the universe, commonly known as the Big Bang, which occurred at least 9 billion years ago and possibly as long ago as 20 billion years.) Our solar system formed when a cloud of interstellar dust and gas collapsed. Because the interstellar cloud had been slowly spinning, the result was a nearly flat rotating disk which we refer to as the solar nebula. Much of the dust and gas in the disk moved to the center of the nebula where it fed a growing protostar which eventually became our sun. A schematic diagram of the collapse of a molecular cloud core to form the solar nebula. (a) The arrows suggest the incident angles between the solar nebula and the material that accreted to it. (b) Once the material was in the solar nebula, most of it was transported towards the protosun (long horizontal arrows). There was a critical radius in the outer portion of the nebula beyond which a small amount of material was transported outward (short horizontal arrows). (c) After the accretion of interstellar material had decreased, dust in the nebula settled to the midplane. This created a zone with a high density of dust near the midplane. A series of aggregational processes swept up this dust to form planetesimals and eventually planets. 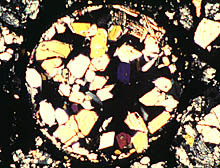 A microscopic view of a spherical chondrule, 1 millimeter in diameter. The bright, colored regions within its margins are mineral crystals. The black region between the crystals is glass and represents once-molten material. This chondrule is in Semarkona, an unequilibrated ordinary chondrite which fell in the Madhya Pradesh region of India. The dust and gas remaining in the nebula was incorporated into primitive planetary material. Initially, nebular dust stuck together (or accreted) to form small, loosely-bound dustballs. In some regions of the solar nebula these dustballs encountered violent, high-temperature events and were melted, forming molten silicate and metal droplets (like lava). Henry Clifton Sorby, a geologist of the 1800's and one of the first to examine these droplets with a microscope, described them as having once looked like fiery rain. Because the high-temperature events were brief, the molten droplets cooled quickly in the nebula and formed millimeter-sized spheres of rock called chondrules. Meteorites containing these objects are called chondrites. Sometimes the temperatures rose so high in the solar nebula that dust began to evaporate, leaving behind refractory residues. At other times, the temperatures became so low that new dust condensed from the nebular gas (like snow from the air). Over time, chondrules, evaporative residues, and condensates collided with each other and accreted to form nebular sediments and eventually larger bodies called planetesimals (a few to several tens of kilometers in diameter). Our most primitive meteorite specimens are samples of these complex, yet primitive, mixtures of nebular (pre-planetary) material. In many cases these meteorites are so primitive they contain traces of interstellar dust which survived thermal processing in the solar nebula. The small planetary bodies from which primitive meteorites come formed throughout a large portion of the inner solar system. Within these vast distances material was apparently distributed unevenly and affected by different amounts of thermal processing. Thus, meteoritic parent bodies produced in different regions of the solar nebula had slightly different chemical and structural properties. The three principal groups of primitive chondrites representing these variations are the carbonaceous chondrites, enstatite chondrites, and unequilibrated ordinary chondrites. In some cases, rocky (and perhaps icy) planetesimals continued to accrete into much larger planetary bodies. The temperatures of these bodies began to increase significantly, in part from the energy deposited by impacts as they grew by accretion. Perhaps more importantly, the thick accumulation of material insulated the interiors of these bodies, preventing heat produced by naturally-occurring radioactivity from radiating into space. They may also have been heated by interacting with a magnetic field that extended from the sun and through the inner regions of the nebula. Consequently, temperatures were able to rise high enough to metamorphose primitive chondritic material (like rocks buried deep in the Earth's crust), causing minerals to recrystallize and grow larger. Meteorite samples of these metamorphic rocks are called equilibrated chondrites, because the metamorphic process also homogenized the disparate chemical compositions of minerals in these bodies. Elsewhere, temperatures became so high in planetesimals that primitive material was completely melted, and thus able to form magma chambers and other features typical of igneous activity. Meteorites produced by these igneous processes are called achondrites, which means they do not contain chondrules. In those cases where planetary bodies became large enough to have substantial gravitational fields, iron-rich metal, which is denser than the silicate portions of magma, may have separated from the partially or wholly molten bodies to form dense iron-rich cores inside shells of silicate material. This process is similar to that responsible for the differentiation of the Earth, and thus why iron meteorites are considered analogues for the Earth's core. Another group of meteorites called pallasites are intimate mixtures of iron-rich metal and silicate crystals, and appear to represent regions where achondrite and iron meteorite magmas were incompletely separated, such as the core-mantle boundaries of planetesimals. The different types of meteorites described above come from asteroids, which are fragments of parent planetesimals or mixtures of fragmented planetesimals. Comets are another potential source of primitive material, but most scientists think that few, if any, large meteorites come from comets. On the other hand, comets contribute a significant number of micrometeorites. In addition, although fragments of comets may not survive as meteorites (in part because they collide with the Earth with higher velocities than asteroids and are thus more likely to be vaporized), they may be responsible for some of the larger impact events on Earth (see Section IV below). Calcalong Creek is a lunar meteorite which was recovered in Australia. 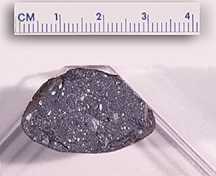 It is the twelfth lunar meteorite to be found and is the first discovered outside of Antarctica. A new and particularly exciting revelation is that some meteorites were ejected from the Moon's cratered surface by lunar impacts. To date, 12 lunar meteorites have been discovered. These samples are important because they may sample a larger region of the moon than that of the six manned Apollo and three robotic Luna (Soviet) missions. We also suspect some meteorites known as SNC's (for the principal meteorites in that class: Shergotty, Nakhla, and Chassigny) were ejected from the surface of Mars, and thus may be our first samples of a neighboring planet.